The good news is that Israel has not lost the war. We can win. As the IDF's long awaited ground assault is demonstrating, on a tactical level, the IDF has been able to learn on the go, and learn well. The bad news is that Israel's national leadership has so far managed to take every political and strategic advantage that Israel has, and turn it into an impediment. Today, assuming Prime Minister Ehud Olmert will let us win, what three weeks ago could have been a rapid victory will now be costly and slow. Regionally and internationally, the threats that Israel faces mount by the day. While all eyes are focused on Lebanon, Syria and Iran have both upped the ante. Diplomatically, Israel is a guppy swimming with the sharks. And as the dangers mount, far from learning from their mistakes, Olmert, Defense Minister Amir Peretz, Foreign Minister Tzipi Livni and IDF Chief of General Staff Lt.-Gen Dan Halutz have gone from acting like rookies to acting like amateurs. And so, as the IDF marches on to an uncertain but still forward marching trumpet, it is becoming increasingly clear that Israel's chief impediment to victory is its government. The week began well enough. In his speech before the Mayors Conference, Olmert made a go of speaking in Winston Churchill's voice. His message of stubborn commitment to victory was so well delivered that even his political rivals admitted he had inspired them. It is true that doubt lurked in the shadows. US Secretary of State Condoleezza Rice's support for a rapid cease-fire showed that the wall of American support was beginning to crack. But Olmert seemed impervious to pressure. Then came that bizarre State Department announcement in the middle of the night informing the IDF that it would be ceasing aerial bombardment for 48 hours. This, together with Rice's announcement Monday morning that working with her colleagues at Turtle Bay she would be forcing Israel to end its operations altogether by Wednesday or Thursday, was the first clear indicator that Israel's leaders had failed to maintain meaningful US support. By Tuesday, Olmert had replaced his Churchillian face with a one more reminiscent of Bill Clinton. To the amazement of the media and indeed of the entire country, Olmert announced that we had won the war. Addressing the IDF War College, Olmert declared, "If the military campaign were to end today, already today it could be said with certainty that the face of the Middle East has changed… Now [Hizbullah] can never threaten this nation that it will fire missiles at it – because this nation is contending with these missiles and beating them." Huh? Olmert went on to say that neither he, nor Peretz nor the members of the General Staff had ever promised us that when the war ends we won't still face the threat of missiles from Lebanon. Even the normally supportive media admitted that was a bold-faced lie. Yet the contempt which greeted Olmert's fabrications and empty declarations of victory did not deter him. In fact, it seemed to embolden him. By Wednesday morning he removed his Clinton mask and went back to being plain old Olmert – the hack politician who was barely elected to Knesset in 2003. Speaking to news services Wednesday morning, Olmert built on his fantasies of victory. By then not only had Israel changed the balance of power and restored its deterrence, it had actually destroyed all of Hizbullah's infrastructure in southern Lebanon. Before Olmert's remarks hit the wires, Hizbullah opened its largest missile attack at Israel to date. In all 231 missiles, including two long-range missiles, rained down on Israel that day. Of course that wasn't all Olmert said. He also told the Associated Press that Israel's "victory" against Hizbullah would pave the way for the implementation of his plan to transfer control of Judea and Samaria to Hizbullah's most ardent supporters – the Hamas and Fatah-led Palestinians. Olmert's empty declarations of victory and his continued obsession with his plan to expel up to 100,000 Israeli citizens from their homes in Judea and Samaria and transfer the areas to the Palestinian Authority are not simply preposterous. They are dangerous. On the domestic level, anyone who takes a look at both the IDF casualties and the IDF troops and officers themselves will see that talk of withdrawing from Judea and Samaria is a recipe for demoralization. Maj. Ro'i Klein, the deputy battalion commander from the Golani brigade who was killed in Bint Jbail last week, died heroically, when after calling out "Shema Yisrael" he jumped on a hand grenade to save the lives of his soldiers. Klein lived with his wife and two young children in the community of Eli that Olmert has slated for destruction. So too, Lt. Amichai Merhavia, who was also killed in the battle, lived in Eli. In photographs making their way through the Internet, Merhavia is seen being beaten by police as he passively resisted the destruction of the Gilad Farm in Samaria in 2002. Last summer prior to the expulsion of Israeli civilians from Gaza and the withdrawal of IDF forces, Merhavia sent a private letter to Halutz. In it he explained why he believed the operation was wrong. Halutz reportedly ordered him thrown out of the army. His commanders intervened and Merhavia was placed on a three-week leave. Between 30-50 percent of the IDF combat troops and officers in the regular army and the reserves are religious. A large percentage of them live in Judea and Samaria. By claiming that a victory in Lebanon will pave the way for them to be thrown out of their homes, Olmert signaled clearly that he doesn't understand the role of a national leader in wartime, and worse, he doesn't understand why victory is essential. Indeed, his declarations of victory themselves indicate that he does not understand the nature of the war Israel is facing or the challenges it must contend with both regionally and internationally. By claiming that Israel has already won when it is absolutely clear it has not, Olmert sends terrible messages to both Israel's ally the US, and to Israel's enemies. He tells the US that it doesn't have to take us seriously as a client. 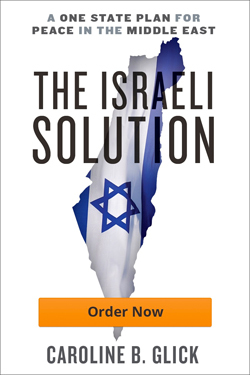 Since we're willing to pretend that we've already won, we tell America that we will accede to any settlement the State Department carves out with the French and the Russians – even if it involves a total Israeli capitulation replete with land giveaways to Hizbullah and the surrender of Israel's right to defend itself to some UN mandated multinational force made up of French dhimmis and Indonesian jihadists. Olmert tells our enemies that they do not have to be concerned that Israel will defeat them because the prime minister of Israel is not planning on doing anything that would involve their actual defeat. This of course emboldens them to widen their attacks. AND OUR enemies are in fact emboldened. Over the weekend, for the first time, Syrian forces detonated a bomb along the border at Kuneitra in the northern Golan Heights. On Monday, Assad ordered his army to ready itself for war. For the first time, this week Assad allowed Druse leaders in Damascus to openly call for a reconquest of the Golan Heights. And of course, Syria is actively assisting Hizbullah by resupplying its forces and providing logistics bases for them. h Foreign Minister Miguel Moratinos went to Damascus, ending Syria's diplomatic isolation initiated after it masterminded the assassination of former Lebanese prime minister Rafik Hariri in February 2005. While there, Moratinos praised Assad's leadership and said that Syria "will play a positive role," in any cease-fire talks. Far from insisting that Syria be shunned for its aggression, Israeli incompetence is paving the way for Syria to be rewarded for it. Then there is Iran, the mastermind of this war. As each day passes, Iran's threats and its actions become more and more extreme. Wednesday, the German newspaper Die Welt reported that Iran sent Osama bin Laden's son Sa'ad, who has been living in Iran since November 2001, to the Syrian-Lebanese border to mobilize Palestinian forces in Syria to fight against Israel. On Wednesday, Iranian President Mahmoud Ahmadinejad made veiled nuclear threats against Britain, the US and Israel when he said, "Today, the Iranian people is the owner of nuclear technology. Those who want to talk with our people should know what people they are talking to. If some believe they can keep talking to the Iranian people in the language of threats and aggressiveness, they should know that they are making a bitter mistake. If they have not realized this by now, they soon will, but then it will be too late." This statement was followed Thursday by his address to the Organization of the Islamic Conference in Malaysia where he again called for Israel to be annihilated. THE UNDENIABLE fact is that the nature of the war that Israel is now fighting in Lebanon is not local. It is not about territory. It is about jihad. Hizbullah is not simply a terrorist organization. It is the Iranian army. According to press reports, over the past six years, some 3,000 Hizbullah fighters underwent military training in Iran. Iran and Syria are not simply Hizbullah's patrons. They are active participants in this war against the West in which Israel is a frontline state. Yet due to Olmert's weak and incompetent leadership and Rice's opportunistic laziness, both the US and Israel are pretending it is possible to see the war as a simple, isolated event. As a result, they are advancing purported solutions, like cease-fires, multinational forces and empty declarations of victory that only increase the dangers. To date, in the interest of maintaining national unity, Israel's political opposition, led by Likud leader Binyamin Netanyahu, has been unwilling to publicly criticize Olmert for his mishandling of the war. This approach has much to recommend it. But what the government needs right now is some very tough love from leaders like Netanyahu, his fellow opposition members Natan Sharansky, Effie Eitam, Yuval Steinitz and Aryeh Eldad as well as from military leaders like former Chief of General Staff Moshe Ya'alon. These men and others, who understand the nature of the war and the dangers Israel faces, need to force Olmert and his colleagues to listen to reason and change course immediately. Amateur hour must end. A difficult victory awaits us.